Do you quilt alone—but not always by choice? 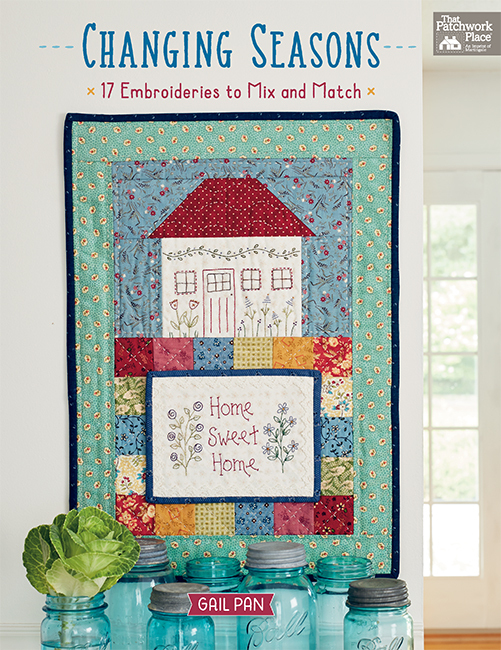 Are you wondering if there are quilters like you right down the block, or just across town? Are you surrounded by good-intentioned family and friends who just don’t get the work you put into that quilt you gave them? 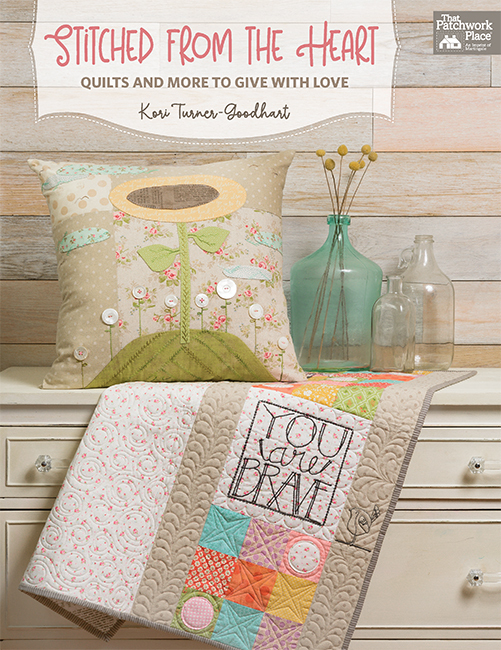 If you said yes to any of these questions, it might be time for you to join a quilt guild. Quilting guilds are packed with people who are cut from the same cloth, sharing the same passion for fabric, sewing, color, and beauty. You’ll likely discover an array of aesthetics and skill levels among the group—not to mention a veritable patchwork quilt of personalities!—and it’s all part of the fun. The common thread lies in the eagerness to share stories about quiltmaking. And we promise, this gang will understand all the hard work you put into a project! When you reach out to join other quilters, it doesn’t have to be in the form of a guild—often you can find informal clubs, quilting bees, or even church groups who meet on a regular basis. 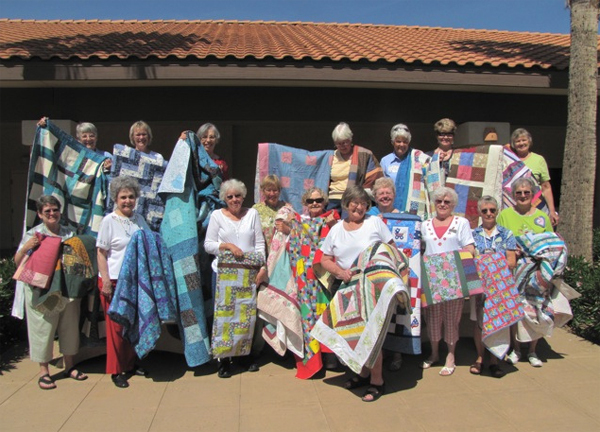 The photo below features the Coffee Creek Quilters, a group of volunteers who teach weekly two-hour quilting classes at an Oregon women’s prison. Each year approximately 150 quilts are made by prisoners and donated to various local charities. Our own acquisitions editor Karen Burns started a guild, Stray Threads, in Woodinville, Washington, in 2007. She says, “Quilters are a very social crowd. When we first started the guild, we didn’t have a lot of money for speakers and high-priced entertainment, but members really enjoyed the social time, and also show-and-tell! We made show-and-tell a part of every meeting, and that was something everybody looked forward to. Wondering about what happens in meetings, or where to find a guild or group to join? Below, get answers to a few questions you may have. What do quilt guilds and groups do? Here are just a few of the activities and events you might find happening at a local quilt meeting. How do I find a local quilt guild? Quiltinghub.com is a growing site that is maintained by the quilting community. In addition to listing guilds, Quilting Hub also includes searchable listings of shops, museums, events, and teachers. 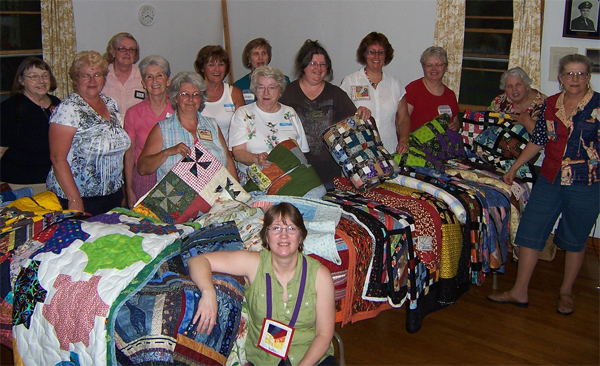 The Modern Quilt Guild is made up of more than 100 guilds across the country and the world. 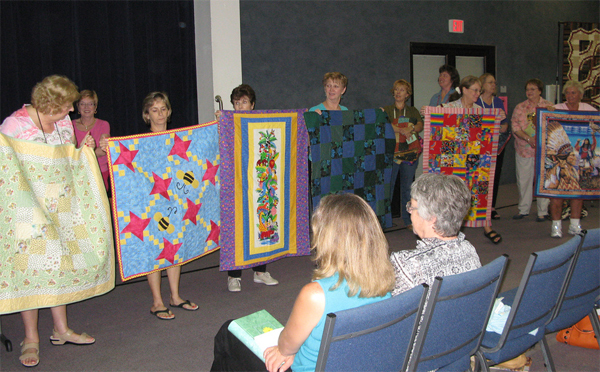 Local guilds were developed so that online communities of modern quilters could start meeting in person. 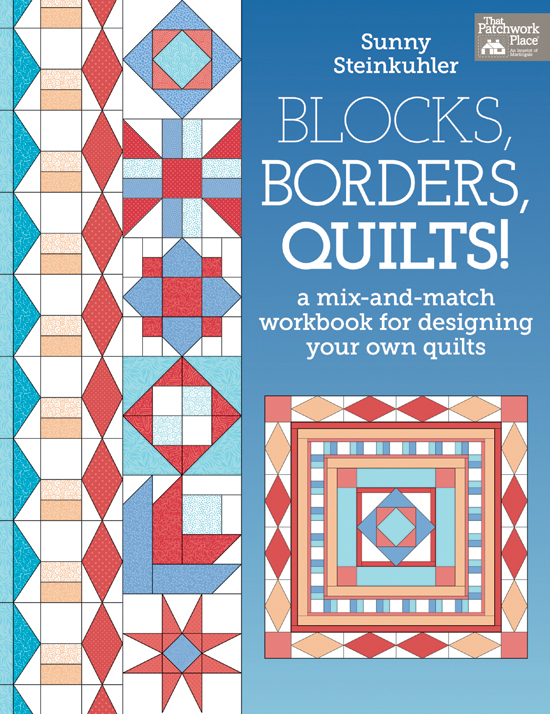 Visit your local quilt shop: your LQS will have the skinny on any quilt-related meetups nearby. Search your state: simply Google “(your state) quilt guild” or “(your state) quilt group” to see if you can find an organization close to you. 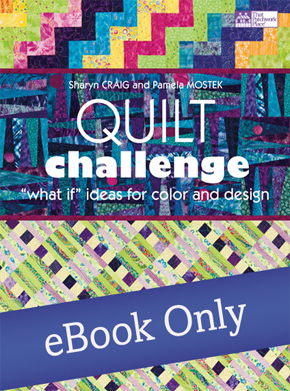 Are you or have you ever been a member of a quilt guild or group? Tell us about your experience—and give a shout-out to your guild or group!—in the comments. I’m a member of the Stray Threads Quilt Guild in Woodinville, WA (Hello Threadies! 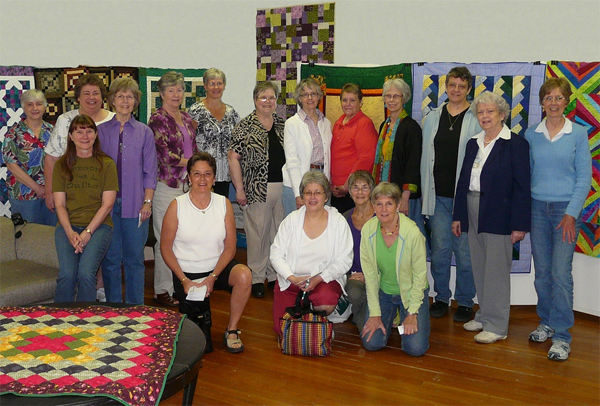 )and the Seattle Modern Quilt Guild. Love them both! Being new to Washington (moved here from Ohio), it was the quickest and easiest way to make new friends and settle into my new home. It’s a joy to sew with people who share the same passion for fabric and creative pursuits. Along with the social aspects come mentoring opportunities, education, community service,and TONS of fun! Not to mention life-long friendships. I highly recommend to anyone sitting on the proverbial fence to join a guild. Like any endeavor, you will get out of it what you put into it. 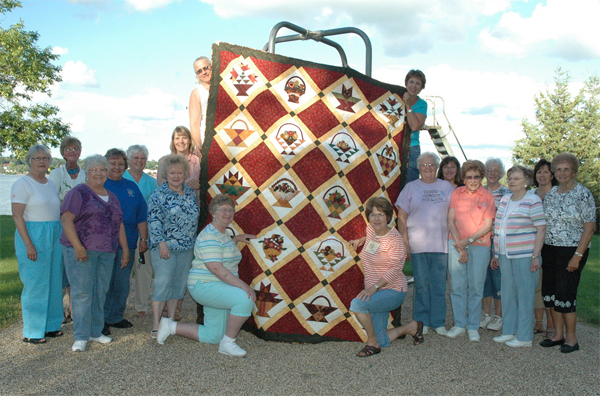 being an active guild member will help you grow and learn as a person and as a quilter. So dive on in! I have been a member, on and off, of my local quilt guild. I enjoy the presentations they sponsor which bring prominent quilters to the meeting to "Show & Tell," and they do offer many other benefits, such as retreats, shows, classes, bees, charity, etc However, I have not had the time to participate in these other activities when I was working and even now in retirement with other commitments. When I first started quilting in 1987 there was a small guild in my area but you only could become a member if you had completed a hand pieced, hand quilted quilt and it passed their guidelines. Shortly after that a new guild in the area started where all you had to do was want to be a member and I joined at their first meeting. They have now been around for over 25 years and have gone through lots of ups and downs. 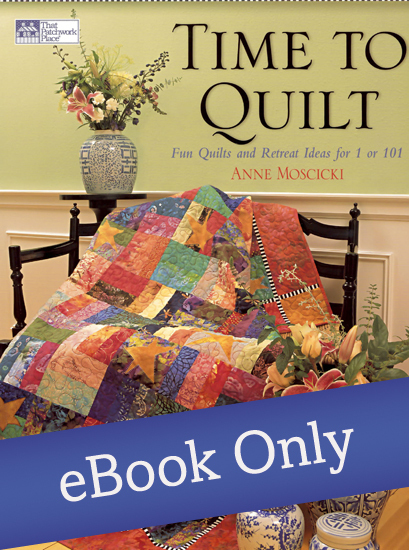 Right now Amoskeag Quilt Guild of Manchester, NH has over 200 members, with lots of great programs, a library, they have a quilt show every other year, raise money and make quilts for lots of charities and have two retreats a year. We just had a pillowcase workshop and including pillowcases made outside of the workshop we have been able to donate over 1000 pillowcases just this year to the Children’s Hospital at Dartmouth. Mountain Laurel Quilters’ Guild in Clarkesville, Georgia is celebrating 20 years in September. It is a lively group of women committed to quilting. We meet on the third Tuesday of every month and have varied programs, twice-yearly luncheons and always show and tell. We made and donated 206 quilts to a local children’s abused childrens’ service, a homeless shelter and hospital for newborns who would not have a nice blanket last year. Monthly workshops teach new techniques and help finish up UFOs. We also have three bees that meet monthly – they have retreats and do lots of creative things together. It is a loving and supportive group that welcomes any level of quilter. About 7 years ago, I nervously attended my first meeting of Everybody’s Quilt Guild in Westminster, Md. I had always wanted to learn to quilt, and was excited to learn there was a guild nearby. I heard about it at the Maryland State Fair, where one of the guild members was volunteering in the quilt section of the handicraft building. Attending the meetings have been one of the highlights of my month, especially now that I am retired and can take part in more activities. I have learned a lot, and made many new friends. Several of us get together often for a sewing day, a trip to a quilt show, or to a quilt shop. I have found everyone to be very friendly and willing to share their knowledge of their quilting skills. Yes, Show and Tell is a big part of the meetings. If you are shy about attending a meeting composed of strangers, just go, introduce yourself, and you’ll find that quilters are very friendly people! With no guild in convenient driving distance, many interested customers of Chestnut Bay Quilting in Caledonia, NY decided to hold an organizational meeting in January 2012, and we are now a guild with 32 members. We held a small quilt show for members only that first year, and expanded to a large show with nearly 200 quilts on display this past summer. We have quilters of all ages, including one still in high school, and all interests – from wool work to hand piecing and quilting to very modern. It is a great group and I am honored be serving as their Guild President right now. We are gearing up for another show in 2015, and working on a project that involves making 160 comfort quilts between now and then. I’m always surprised when people seem to deliberate about joining a guild. "Should I or shouldn’t I?" It’s a club, with annual dues and monthly meetings at a minimum, and more ways to participate if you are inclined. It’s not a lifetime commitment. Guilds, like other community organizations, create social capital (as espoused by Robert Putnam in Bowling Alone http://en.wikipedia.org/wiki/Bowling_Alone) which is in short supply in our contemporary society. I joined a Thursday morning quilting class at The Cotton Angel in Monmouth UK 3 years ago. Little did I know that at the ripe old age of 60 I would embark on a new hobby that would change my life. I had never made anything before, I smoked like a chimney, was depressed and had totally lost my direction in life. 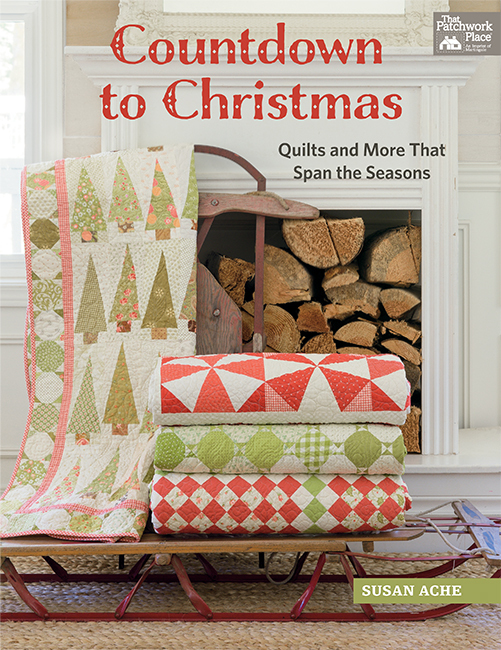 That all changed when Barbara Jones, owner of the Cotton Angel taught me and a few others how to make quilts. I no longer smoke (rather spend on a fabric stash), I have found a creative side to me that I never knew existed, I make quilts and other bits and bobs for charity, family and friends. My doctor has seen an amazing change in me since i started quilting and every day has purpose and direction (even if it’s chain piecing loads of squares for a new project). Now I don’t think you could call Barbara’s class a quilting guild but the skills, friendships, creativity and love that comes out of the Thursday morning quilting group is second to none, I can honestly say it has saved my sanity and probably my life. I love quilting! I have attend a quilt guild, but time, distance, dues and need for a adult sitter made it hard. I have belonged to American Sewing Guild for many years. I love to attend the meetings, which have many different presentations. All the members share their experiences, expertise and suggestions for many craft areas. When anyone has a problem, members offer good solutions. Also through the guild, many classes are offered, there are many charity sewing events and I have made many friends. I have been a member of Rochester (MN) Quilter sewciety for about 30 years. What a talented bunch of members. We are about 235 in number and have both an afternoon or evening meeting once a month. Our group has done some pretty terrific things for our community. The best thing of all is the sharing of this talent with each other. Our group has such a wide variety of tastes and skills that I look forward with excitement to the first Monday of the month. I also have the good luck to be in a ‘small’ group of 8 quilt friends who meet twice a month to stitch and chat. As a long arm quilter I also have the support of "Seams"‘ our South East area Minnesota long armers. That group is a wonderful way to share the skills and business end of machine quilting I hope every quilter could have a group like mine for support, encouragement and of course company on quilt hops and retreats! When I went from teaching full time to substitute teaching I joined our local quilt guild, the Washington Stars in Olympia, WA. I loved show and tell as well as the speakers on our program nights. I learned a lot in a short time. Like many others, I found it hard to get to know people in the large group and was glad when we decided to add smaller "bees" who meet at different times from the large guild. I am in two bees, one focusing on hand quilting and one exploring art quilting. When my husband and I decided to "snowbird" this winter I was afraid I would really miss the social aspects of the guild. Not to worry! I joined a guild here in California, the Santa Clara Valley Quilt Association and even found a small bee who adopted me. There are great people who quilt wherever I go! And what a nice way to make friends! I joined the North Star Quilting Guild in northern Manitoba about 15 years ago when I was in search for like minded quilters. I did not know a soul when I walked into that room but I was confident I was going to find what I desperately wanted with those 80 women. I have not been disappointed. I am just finishing a two year term as the guild’s president. The skills, ideas and friendships I have because of my involvement with my guild has made my quilting journey far more than I ever dreamed. Icy, snowy roads can not keep me from my 45 minute drive to guild events. Other activities are planned around guild events. When I went to the local quilt guild for the first time, the first thing I was told was, "I hope you have the correct amount." No smile, nothing. I replied, "This is my first meeting. How much is the meeting?" I was handed a brochure and told to read it – and the "greeter" walked away. I walked away too – back to my car. I joined a small group here in Fillmore. I think we just call ourselves Fillmore Quilt Guild. We learn so much. We are doing a BOM this year as well as making various projects such as a bed runner and just this month we learned about hand quilting. I really enjoy Quilt Guild. We do a show and tell each month and I have seen so many wonderful quilts and have been able to share my quilts with them. It really helps boost my confidence. I am in a Quilt club, not quite as formal ad a guild, but a lot of fun. I am a member of Pieceful Hearts Quilters Guild in North Augusta, SC! I have been a member for about 16 years! We have workshops that help us grow our skills, we make a quilt to raise money for a camp for children with cancer and blood disorders, we have retreats to enjoy every year and we have show and tell every month! So much fun! YES you should join a guild! Don’t be intimidated by their skills, let them mentor you. They didn’t start out as experts either. I confess. I like using triangles on a roll or triangle paper. I have downloaded many sizes of triangles in an 8.5 x 11 format. I print on tearaway paper piecing paper using my printer. Sew on the lines and cut, press and trim any dog ears. Works perfectly. I remove the papers while watching TV! Have been in a small guild for 20+ years. took a few years to get involved, then held many positions up to and including president. unfortunately the clash of personalities was not interesting to me. so i bowed out for a few years. back now for programs. exciting to see how many guild activities i started and still flourish, but sad to see the decline of membership. time marches on. i meet regularly with 2 smaller groups, and attend programs in several other guilds. life is good! I joined the "Mountain Meadow Quilt Guild" in Sunriver, Oregon in 2006. I have enjoyed the new friends I found there, and continue to have a terrific time sewing quilts and bazaar items for numerous charities and fund raisers. The Guild is made up with experienced and interesting members, that are more than willing to share their expertise. We have 15 Master Quilters who top the list, and over 200 more who continually volunteer for various teaching and staffing assignments. We are connected to, and participate in, the "Sisters,Oregon International Quilt Show" each July. What a wonderful and fulfilling way to spend your retirement!! I belong to 2 quilting groups that meet monthly and to one on line quilting group. I’ve been a member of Crazy Quilters of Federal Way since 1993 or so. I’m very involved there, have my fingers in lots of pies, including newsletter editor. I joined Covington Quilters in 2008, thinking I could sit back and enjoy myself without a lot of volunteering. It didn’t take long before my hand floated up into the air. I enjoy both guilds, have made wonderful friends in two cities, and am inspired by fellow quilters at every meeting I attend (which is 3 a month between the 2 guilds). By the way, I belonged to Evergreen Piecemakers in Kent when I first joined Covington, and finally decided 3 guilds was too many. Both Crazy Quilters and Covington meet on Thursdays, so that’s my quilty night. I love to visit your blog, full of informative and helpful posts. Actually I have not been a member of any local quilt groups. I have not had the time to participate in other activities. I want to join group for nice quilt’s designs, it would be a good inspiration for me. I am a member of a wonderful guild love the ladies,the chats and laughs.My one complaint is we have a member that is a business woman and sells her wares.When we do a project we seem to be paying for her time,I thought a guild was to share you ideas and knowledge with each other.Am I wrong in my thinking? 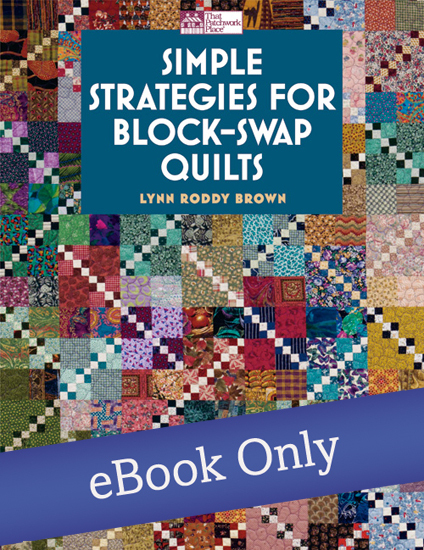 This is some great information, and I appreciate your point that quilt guilds have activities and socialize. I’ve recently taken up quilting, but none of my friends or family share this hobby, so I’d like to find some other people who do. I’ll definitely look into joining a guild so I can socialize while I pursue this interest of mine. Thanks for the great post!